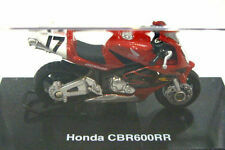 You are purchasing a new Harley Davidson 2003 V-ROD 1:18 scale. Item ships USPS within one business day. U.S. SELLER. Thank you for your business. 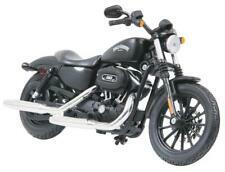 1 PC Harley Davidson 2014 Sportster Iron 883 Diecast. They have a working kick stand, the handle bars can steer and the wheels can spin. These models don’t need any assembly or painting. They are ready for display out of the box (or even inside the box). New been sitting on shelf awhile some small creases in boxes and plastic. A small rip and a fold in coa. 2013 HARLEY DAVIDSON FLHTK ELECTRA GLIDE ULTRA LIMITED. 2015 MAISTO. H-D CUSTOM SERIES 33. Bruder has now added this impressive motorcycle to the range. Bruder Ducati Scrambler Cafe Racer with Driver Vehicles - Toys. • Scale 1: 16. • Folding side stand. New Ray Toys. Scale Model. Color : Green. We understand that such delays can be very inconvenient when they occur, but we do not have any influence over such situations. #9692- U.S. SHERIFF- ON A HARLEY DAVIDSON ELECTRA GLIDE. Harley Davidson Does it again. Smoke & Dust Free. Motorcycle stand Skate board. THIS PRODUCT CONTAINS A CHEMICAL KNOWN TO THE STATE OF CALIFORNIA TO CAUSE BIRTH DEFECTS OR OTHER REPRODUCTIVE HARM. Maisto 1909 Harley Davidson Motorcycles Twin 5D V-Twin. The pictures give an accurate detail of the item's condition. The photos are of the actual item being sold and are as detailed as possible. This is a Racing Champions 1/9 Scale Jeremy McGrath Honda CR250R Motorcycle #1. This was made in 1995. Being sold as is. Waiting for the invoice may also be required. HARLEY DAVIDSON SPRINGER SOFTAIL. 2000 HOT WHEELS. 1/18 SCALE. Released back in 1982. Friction powered and made in Japan. Used and complete condition, motorized function does not work. For display or restoration only. Still perfect for any enthusiast or collector. ONYX HM 003 Luca Cadalora and HM 010 Loris Reggiani. Like new in original cases. 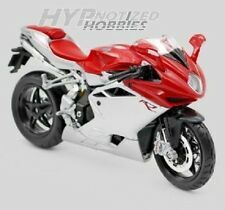 You are purchasing a new in box Motor Max Kawasaki Ninja 1/12 Scale. Item ships USPS within 1 business day. U.S. SELLER. Thank you for your business. Produced by Maisto in 1:18 Scale. " 1999 FXSTS Springer Softail. "Harley Davidson Series ". Bike is 4.5" Long, 2.5" High and 1.5" wide. Real Rubber Tires. Working Kick Stand. There are many other reasons and I would love to share them with you if you are interested. Die Cast Replica Toy. In the event of product failure or defect, products are limited to the manufacturer warranty. You are purchasing a new Harley Davidson 2003 Fat Boy 1:18 scale. Item ships USPS within one business day. U.S. SELLER. Thank you for your business. Product Details. Item must be New and Unused in original factory condition. 2001 Hot Wheels Harley-Davidson Heritage Softail Classic 1:18 Die-Cast Model. You get the exact item shown in the pictures. Selling as used due to package damage ( stains & tape marks). See pictures for details. Still sealed in packaging. Feel free to ask any questions! 2000 Ricky Carmichael #4 Kawasaki Road Champs MXS Excellent shape! In original package. This item is great for customization or used diorama prop for toy photography. 1/12 scale used motorcycle8" long, 4" tall. 1-# 9679 GERMAN DISPATCH RIDER. 2- # 9682-U. S DISPATCH RIDER. The bike was removed from the box for pictures only and has never been on display or played with. This is a 1:18 scale bike. Produced by Maisto in 1:18 Scale. BLACK 2001 FXSTS SPRINGER SOFTAIL. "Harley Davidson Series ". Bike is 4.5" Long, 2.5" High and 1.5" wide. Real Rubber Tires. "VERY Nice Model". Update does not include those who live in Alaska, Hawaii or Puerto Rico. Bruder Ducati Scrambler Desert Sled with Driver Vehicles - Toys. Bruder has now added this impressive motorcycle to the range. • Scale 1: 16. • Folding side stand. Micro Machines collection 21 "Hot Bikes Collection" by Galoob (no 6400). These are obviously complete bikes. RC POLICE BIKE. RC HELICOPTERS. RC SUBMARINES. RC TRUCK BODIES. RC CONSTRUCTION. RC CAR BODIES. RC ELECTRONICS. BIKE LEANS INTO CORNERS, TONS OF FUN, HAS TURBO BUTTON LIGHTS. Pair of ERTL 1:32nd Scale (Approx 2½" Long), Polaris ATV. Made of Durable Plastic construction. Real Rubber Tires.